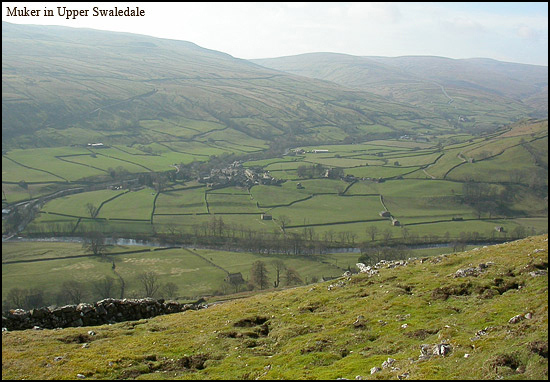 Following the Pennine chain of hills southwards from Weardale and Teesdale, evidence of mining activity extends into Yorkshire through Swaledale, Wensleydale and Wharfedale as far as the area around Skipton and Pateley Bridge. From a collector’s point of view Yorkshire has been somewhat overshadowed by its more famous northern neighbours yet it has produced some excellent finds of fluorite and barite plus various secondary minerals including ktenasite, gearksutite and otavite. The best specimen fluorites are the amber coloured material from Wensleydale or the clear/purple edged specimens from the Greenhow Hill area. Twinned fluorite crystals are rare, differentiating the mines and quarries here from those in County Durham to the north where twinning is more common. The area has produces fine barite specimens predominantly of a tabular pyramidal (chisel) form as well as botryoidal material similar to Derbyshire Oakstone, the Yorkshire specimens taking an equally fine polish. Other species occurring in specimen quality are galena, calcite, sphalerite, strontianite, chalcopyrite, witherite and secondary zinc minerals such as hemimorphite, smithsonite and aurichalcite. Recent work has shown that pyromorphite is more prevalent than previously thought, but not common. 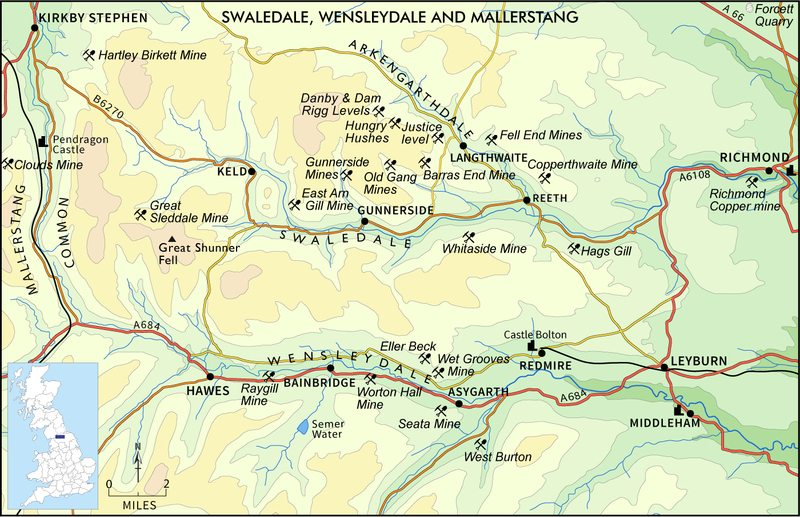 The Yorkshire Orefield was predominantly a lead mining area producing an estimated 1,000,000 tons of lead concentrates. Small copper deposits occurred on the periphery of the mining field, as at the Richmond mines, but commercial deposits of zinc, fluorite and barite are largely absent. The mineral deposits occur in Carboniferous rocks. 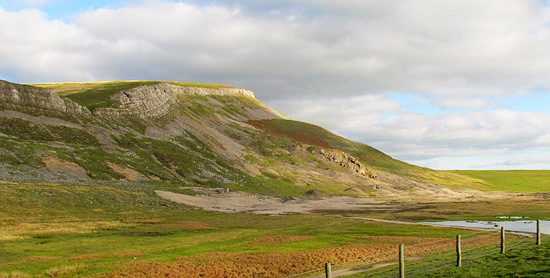 Post Carboniferous uplifting of the area between the Stainmore Trough and the Craven basin connected with the Caledonian granite underlying Wensleydale providing the pattern of fissures facilitating the vein channels. 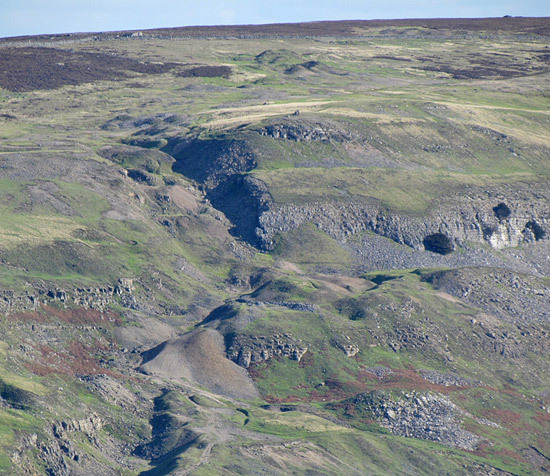 In the east of Yorkshire large deposits of ironstone were worked in the North York Moors but being a low-grade replacement deposit little of interest for the collector was ever found. A little to the north of Whitby the relatively recent exploitation of the Zechstein evaporates at Boulby mine has provided excellent specimens of borate minerals. 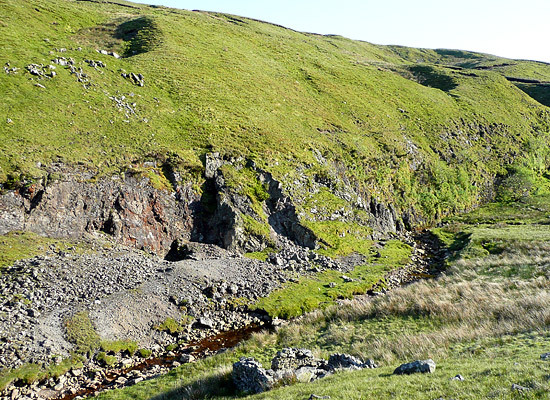 The finding of two pigs of lead near Greenhow with the stamp of Emperor Domitian provides evidence of mining in Roman times and there is circumstantial evidence that the Brigantes who occupied the Pennines at the time of the Roman invasion worked the vein outcrops. The first recorded mining was in 1145, at which time, Jervaulx Abbey had a grant to dig iron and lead ore in Wensleydale. Until the 16th Century many of the mines were under monastic ownership. Increased mining activity was in part driven by the era of castle and monastery building both in England and the Continent with the use of lead for waterproofing roofs and construction of gutters. 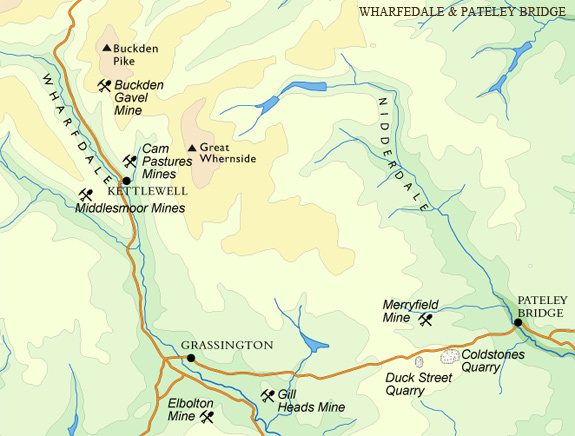 Yorkshire, along with other areas in England enjoyed a resurgence of mining activity during the 16th Century with many mines operating although most worked independently and on a relatively small scale. Monastic ownership ended after Henry VIII’s dissolution of the monasteries (1536-1540), large areas of Yorkshire being sold by the crown or given away for services rendered. Mineral rights and land ownership were usually common but subsequent sales of one or the other meant that as time has gone on this is not always the case. From the 17th century onwards many of the mines consolidated into larger concerns defined by geographical areas, the change driven by technological developments which favoured larger operations often with the lessors taking a direct interest. By the late 19th Century the depression in lead prices and failure to find ore at depth ended mining of any significance. 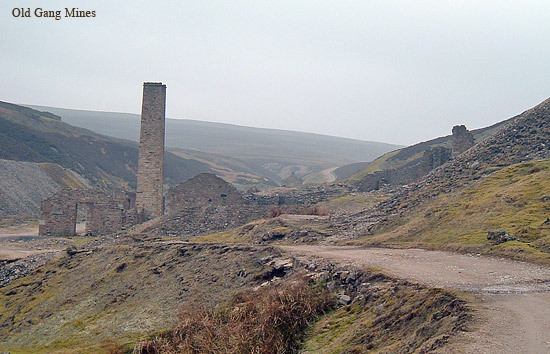 Yorkshire did not have the large deposits of zinc, iron, fluorite or barite that enabled mining in the adjoining counties of Durham and Cumberland to continue well into the 20th Century. 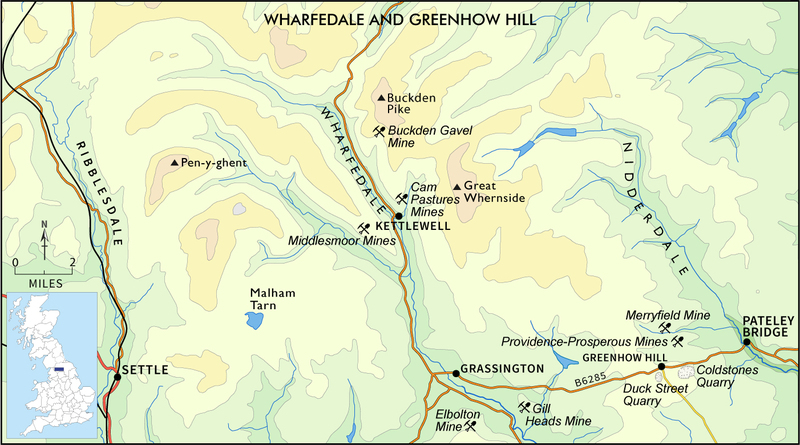 The exception to this was the Greenhow Hill area where fluorite was more abundant, and in the 1920’s a water tunnel driven underneath the area by Bradford Corporation discovered a number of hitherto unexploited veins. 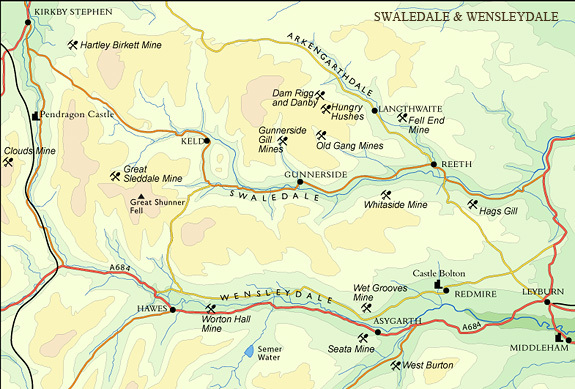 Numerous old dumps cover the area from early bell pit workings and later levels, driven from lower down the fellside. Material on the dumps show the veins here consisted of galena with banded brown barite which, after cutting, polishes well and resembles Derbyshire ‘Oakstone’. Crystalline barite is rare but occasionally forms small but sharp brown elongated crystals sometimes associated with transparent sprays of hemimorphite. Pyromorphite is rare but occurs on one or two of the dumps. Interesting line of dumps along the vein extending eastwards from Fremington Edge have produced some interesting minerals including purple fluorite, pyromorphite, yellow smithsonite and hemimorphite. Barite is common here and has been found in aesthetic aggregated lustrous crystals of a tabular form. From the nearby Danby Level specimens of classic tapered pseudo-hexagonal witherite were found, perhaps the best from Yorkshire. A small openwork with many forms of barite. Black and green coloured crystals predominate although white and colourless specimens also occur. Many of the barite specimens are part covered in crystalline and amorphous hemimorphite. A little barytocalcite too. A working quarry. Azurite and malachite have been found along with a little calcite. Fell End Mine and Slei Gill, Arkengarthdale. 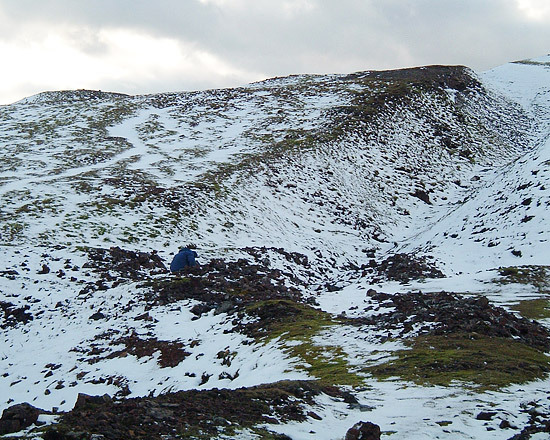 This is an extensively mined area with numerous hushes, bell pits and levels. Witherite occurs in large nodules sometimes with crystallised interiors. Barite stalactites occur on some of the dumps especially at Fell End mine whilst in Slei Gill, Primrose vein produced a pink/orange banded barite, A parallel vein to the north shows veined aragonite which takes a good polish. Hemimorphite occurs in small but attractive crystals and sprays. Bunting (or Bunton) level has produced specimens of strontianite, cockscomb barite and pseudomorphs of smithsonite after strontianite. Good strontianite crystals up to 4 mm in groups up to 15 mm across with small yellow fluorite cubes occurred in Sun Hush Level whilst radiating masses of white strontianite to about 10mm associated with barite and sphalerite were found in Priscilla level along with small witherite crystals. Sir Francis Level also produced strontianite specimens as sprays to 20 mm. along with good f translucent calcite and pseudo-hexagonal grey witherite crystals to 25 mm. Locally pyromorphite is quite common on Old Rake vein. Barite in well-formed elongated crystals of a pale bluish hue. An area criss-crossed with large hushes and more recent ganister workings. Plates of cockscomb barite as do well-formed galena cubes, some cerussite and sharp quartz crystals from the ganister workings. Pyromorphite ranging from colourless to green and brown occurs in attractive sprays with crystals to about 6 mm in length. In Hard level, North vein produced good strontianite sprays to 15 mm whilst from Old Rake level iridescent sphalerite on white cockscomb barite has been found as well as pale yellow fluorite, and white/grey strontianite masses to 15 mm. In 2003 a sub-level here produced the rare minerals ktenasite & gearksutite. 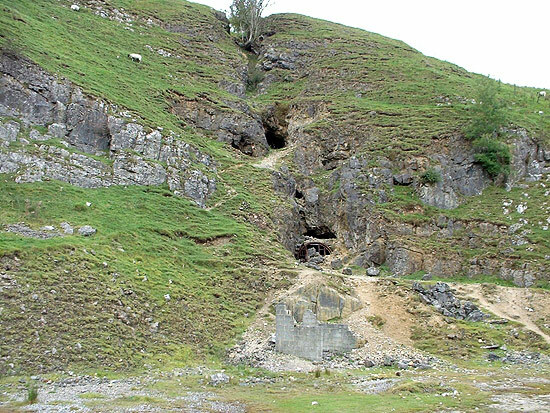 Some of the best Yorkshire cerussites have come from Brandy Bottle mine in an area at the bottom of the incline. Specimens show delicate white platy crystals of good lustre, the best specimens on iron stained barite. Other minerals found are barite, hemimorphite, aurichalcite, siderite and witherite. Small scattered dumps have produced amber and purple fluorite, beds of nail head calcite, small gemmy sphalerite crystals, smithsonite and cinnabar coatings. Interesting isolated mine where small sharp azurite crystals with malachite and occasionally barite occur. It is best known however for the well formed clear to amber fluorite crystals up to 15mm across. For further information on the mine see UK Journal of Mines & Minerals, issue No.7 (1989). The mines around West Burton have in the past produced fine fluorite specimens with cubes up to 30 mm across of a pale purple colour. Extensive workings here have produced some of the best specimens found in the Yorkshire Pennines. Barite is particularly well crystallised here in various habits and sometimes of a pale blue colour. Fluorite is common with clear to pale yellow un-twinned cubes to 60 mm. Calcite occurs in simple nail head form and in more complex aggregated habits. Some of the best Yorkshire aurichalcite occurs here and smithsonite is relatively common but of an unattractive grey to pale orange colour. Close to the village of the same name the mine has yielded specimens with a pleasing amber and purple fluorite cubes as well as a less attractive grey colour. The later have quite rich sulphide inclusions and can get up to 40mm across. Associated with the fluorite is a little crystallised nail-head calcite. Aurichalcite, aragonite, hemimorphite crystals to 10 mm occur here as does yellow smithsonite. Sharp pseudomorphs of goethite after marcasite on shallow dumps from nearby trials. Beds of small but extremely lustrous hemimorphite crystals. Yellow, grey and brown beds of smithsonite and small but perfect barytocalcite to 2 mm. A large working quarry where limestone extraction periodically cuts through a complex of mineral veins which over the years have produced excellent specimens of purple and clear fluorite, nail-head calcite, barite, hemimorphite and galena. Occasionally anglesite crystals up to 40 mm long have been found as have attractive sharp white blocky cerussite crystals up to about 8 mm. Rarely otavite and doyleite have been reported. A disused quarry where in the past large fluorite cubes, calcite and minium have been found. Some excellent attractive fluorite specimens have turned up in the last few years with clear centres and well defined purple edges. Known for distinctive and attractive groups of clear fluorite cubes up to 30mm with strongly coloured purple edges. The mine was one of the last to be worked, not closing until the 1980’s. Excellent ‘Old-time’ strontianite specimens were found here. The dumps from a series of bell-pits and a small opencast on Middlesmoor were found to be rich in smithsonite with coatings up to 20 mm thick. Sequentially deposited layers show bands of colour including green, pink, grey (predominant) and yellow although, because of weathering, most specimens lack the distinctive smithsonite lustre. In the 19th century Celestite was found at a number of locations in and around Knaresborough. Fine specimens from here can be seen in both Scarborough (Rotunda museum) and the Natural History museum in London. Boracite specimens have long been known from the German salt deposits and occasionally in large coarse crystals from South America. 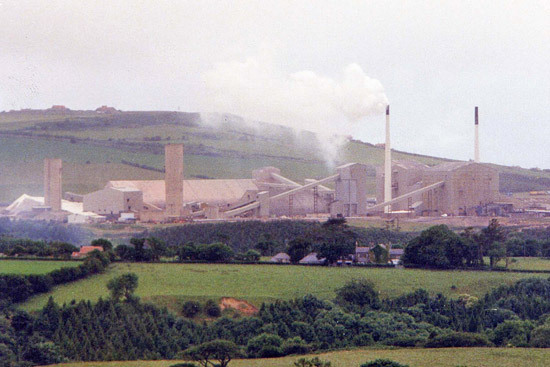 However, some of the best material, often associated with hilgardite and magnesite, has come from the relatively new mine at Boulby opened in the early 1970’s on the east coast of England. Commercially the mine produces potash for agricultural uses and halite for de-icing roads in winter. The horizontal evaporite ore body, up to 7.5 metres thick is worked at a depth of over 1000 metres. Nodules of boracite and associated mineral up to 1 metre in diameter occur in a distinct bed just above the base of the potash deposit. The boracite occurs in a variety of forms from single crystals to aggregates and although normally white to colourless pseudo-cubic crystals, the most sought after specimens are green to electric-blue pseudo-tetrahedral crystals. Unusually, specimens that are a pale blue in daylight appear a darker blue when viewed in tungsten light. The rarer hilgardite is occasionally found with the boracite as pink-orange aggregated crystals whilst magnesite occurs sparingly as transparent plates. 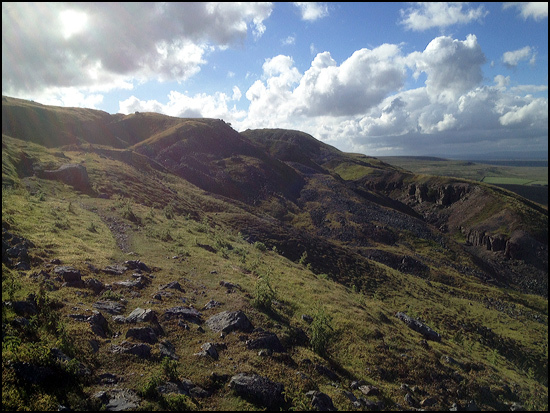 Black lustrous crystals to 2 cms were found in the 1980’s in a now abandoned area of the mine and have subsequently been shown to be trembathite (See UK Journal of Mines & Minerals, issue no. 25). The best specimens of boracite came from a spectacular find in 1991. Recently volkovskite, a rare borate, has been found here for the first time in the UK and in surprisingly large crystals. Beach boulders have occasionally produced sharp lustrous rosettes and rhombs of calcite with rarely a little barite. Pleasing pyrite groups have also been found with well-formed crystals. The South Bay at Scarborough is the type locality for both scarborite and hydroscarborite. However, neither would win any prizes for aesthetics! Mining on a small scale has produced plates of small fluorite crystals both amber and purple, azurite, barite and calcite. A small mine noted for malachite and small crystals of azurite. Just outside the map areas, the Conoley lead mine near Skipton produced excellent specimens of cerussite but are rarely seen onto the market now. During road widening on the A1 trunk road near Bramham in the early 1990’s mineralised pockets were found in the Magnesian limestone containing barite, calcite and goethite pseudomorphs after pyrite. Recent work has shown that a number of collieries in the coalfield had specimen quality minerals but there seems not to have been a culture of collecting them as there was in the lead and fluorite mines. Typically, the species found were sulphides, sulphates and carbonates. Sheffield Museum has a large barite specimen from Manvers Main colliery near Wath upon Dearne with prismatic and tabular baryte crystals up to 70 mm in length. An article is planned for publication in the Russell Society Journal giving a full description of mineral occurrences in the coalfield. General Note - For any of these localities listed above permission must always be sought before visiting and never enter old mine workings.